VERY SOON A DEAFENING CACOPHONY of promises will be heard from politicians who have filed their certificates of candidacies. This happens every election time- yet nobody really bothers if the “promising” politicians have a word of honor. Part of the problem lies within the Boholano electorate itself. 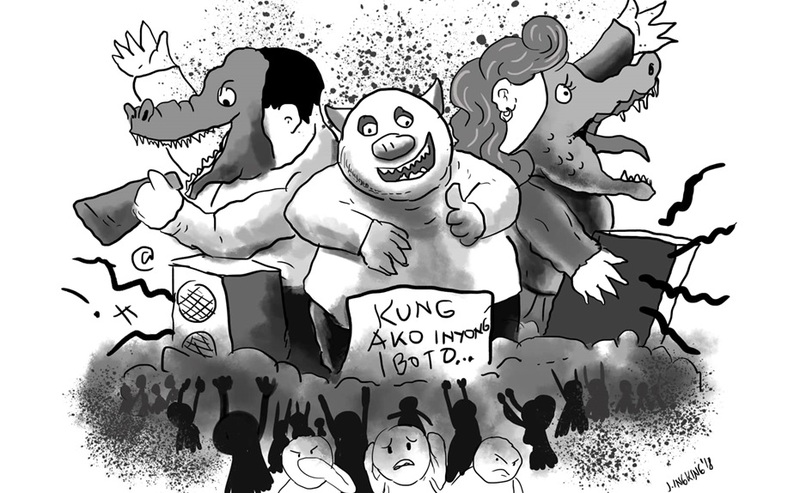 People love to hear bombastic attacks on personalities and allegations of crime and graft. It is part of the Theater of the Absurd -but people listen and savor them, anyway. People also love to hear of promises of the Nirvana on earth, glowing imaginings of “things that could be” – no matter how incredible to achieve- so that they can have, for one moment, be led into a fantasy land that obviates the cruel reality that faces them daily. It is a shot of heroin in the veins -to make people forget how a Third World a country we really are, despite glowing economic figures of high GDP (Gross Domestic Product) growth years for the last 8 years or so. But- for a change- we wish Boholanos should start to be more discerning and strictly evaluate as to what will be best for Bohol. Because like any other province, there are assets and setbacks as far as socio-economic development in the community is concerned. For Bohol, the cherished laurels that are pretty obvious are spearheaded by the Tourism development which has brought the province to become one of the most popular destinations in the country today. Unlike before when Bohol was of an unknown quantity and brought to the national limelight only because a dark, intelligent and charismatic leader from the town of Talibon became the 8th president of the Republic of the Philippines. Tourism has a wide multiplier effect-providing sources of livelihood to vehicle transport operators (including tricycle drivers), fisherfolks for marine food, farmers for fruits, vegetables, poultry, and processed food, tour agencies and guides, and personnel for resorts, hotels, and restaurants. Now, every Boholano here and overseas proudly admits that Bohol is his home province. We have developed a community pride – that of being a part of a hospitable and peace-loving people., the way the honored Rajah Sikatuna was to virtual strangers from the other side of the globe who were lily-white and had long noses, as well. So much unlike them. Next in the proud list is that of our many excellent roads all over this island province. Let us the start with the Circumferential Road that circumscribes the outskirts of this ube-shaped province- allowing the visitor to do a “Round Bohol” in less in a day. Sandwiched by the azure blue seawaters on one side and the verdant, green forests and hills on the other. Even many of the roads in the interior barangays are concreted. In fact, this fact has attracted even the Alta Tour de Cebu, a popular tour program among the rich and famous who own expensive cars – and are somewhat assured- they will be none the worse for wear because of these roads. Of course, the soon to be opened Bohol Panglao International Airport is such a major achievement. A real game changer. Another plus factor for Bohol is the active private sector which is very supportive of governance. Several provinces have benchmarked this close collaboration of the private and government sectors here, something they find almost hard to replicate. There’s is somewhat of a dysfunctional relationship- where criticism becomes destructive and developmental goals are not in consultation with or in consonance with the desires of the private sector- the true Engine of Development in their own provinces. Government is just an important ancillary. This is true in most other provinces . But if we have these assets, we also have our setbacks- a yin for a yang, as one’s favorite Geomancer might articulately say. One of this seems to be the lack of solid support to the agricultural sector of the province. In retrospect, ours is probably a microcosm of what is happening to Agriculture in the nation. It provides less than 15% of the GDP growth. The problems that Agriculture in this country is known to all since years back – but the solutions seem to elude us year in and year out. Because if not, why this anemic performance when compared with Service and Manufacturing sectors? Even those in the restaurant and resort operations feel the pinch of this lack of quality vegetables and fruits to supply the growing market in Bohol. Prominent among these are high prices of fish in the locality, This is something which is not justifiable to just admit as Bohol has vast acres of land waiting to be tilled and the seawaters and rivers galore for the fish to be caught or artificially propagated. As in the general statistical chart of the nation- there is also income disparity in the province of Bohol even if provincial GDP is pegged at 9% – higher than the 6.5% national average. Economic growth is not equitably shared by all and the disparity between wealth and income between the rich and the poor has not been materially altered. Like in many provinces, some pockets of corruption still slowly erode the nooks of governance- where patronage politics dominate the distribution of economic opportunities – not just in the granting of permits and franchises to the privates’ sector but also in deals involving government funds. Politicians in the campaign trail must explain how they expect to raise the standards for ethical transparency and accountability in things they will decide and do while in office. Let us not forget that just as important as “doing the right things” is “to do things right.” That lookout stands for competence and trustworthiness, respectively. Are the candidates up to these standards of measurement? But in general the development of Bohol has taken off- maybe, not yet in a Big Leap Forward kind of way – but the statistical numbers cannot be argued against. But we must admit that the problem on drugs continues to abate. Bohol being ranked number 4 in the country and number one in the region in the Drug Problem Matrix have been explained enough because of the massive arrests in every barangay which generated the big numbers of drug users. There would be no arrests nor killings during raids if there is no substantive drug business thriving in apparent ease in some cases. What about peace and order? Bohol had earned a good reputation in the past as a model for erasing the Red insurgency here by a combination of military and socio-economic tactics and programs. There are sporadic news of some attempts to regain entry in some towns again- how up to it is the government with this impending menace? What about the Inabanga incursion by the terrorist group aimed at disrupting an ASEAN meet here and thus embarrass the provincial leadership and the national government.? Are our land and sea entrance points still porous as to allow again these with men armed with guns and bad intentions to seep into our midst- with bancas and war material? How much in percentage points has our intelligence mechanism taken off after that Inabanga fiasco? Soon we will hear promises of candidates for the coming election. There will be criticisms against those sitting in governance. Hopefully, there will be platforms presented. As a responsible electorate, we should be matured enough to listen and be objective to comprehend whether these criticisms are legitimate or just born out of political swordplay. Have we progressed enough or have we been missing the train all along? Whose program of action will make our beloved province meet its best possibilities? ARE THERE PROTECTORS OF OF PIRYAHAN NG BAYAN? The PSCO is losing millions due to the existence of Piryahan ng Bayan, betting stations mushrooming in the province appearing as if legitimate lotto stations of PCSO. In Bohol there are about 300 of them in the towns. We could not understand why the authorities especially the Philippine National Police (PNP) is not running for their closures since they are illegal. The PCSO has mounted a campaign but to no avail as far as the PNP and even some local officials are concerned. We know it is only the National Bureau of Investigation (NBI) which is raiding these illegal lottos. WHy only the NBI and not the PNP?